Sikh Dharma International and the Office of the Secretary of Religion are pleased to offer this course, especially designed for Sikh Dharma Ministers by SS Gurujodha Singh Khalsa. 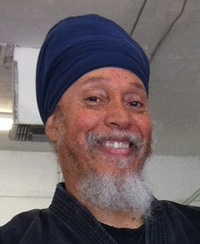 As a sixth-degree black belt, SS Gurujodha Singh has been an instructor of Kenpo Karate for the past 25 years. He has taught martial arts and self-defense at Khalsa Youth Camp and 3HO International Women’s Camp. This course was developed to create spiritual warriors who foster peace in every environment in which they are present. If there is disharmony or violence of thought, word or deed, it is the duty of the Spiritual Warrior to neutralize violence, protect and preserve life and re-establish harmony, balance and peace through their thought, word and action. Such responsiveness requires training and skill. In recognition of the need for Ministers to have a simple but dynamic interactive vehicle to train their minds, bodies and spirits to be agents for peace in the coming age, Walking Tall was developed. Eight Sessions, 11 minutes each. Viewable online, anytime, anywhere. Expand and deepen your relationship with yourself, your Dharma, and Shabd Guru! In this small group tele-course, you will be guided by the facilitators, SS Mata Mandir Kaur and Sat Kaur (Canada), and joined by expert teachers in many areas of the sacred Sikh path. The make-up of the group is diverse and inclusive. We welcome those who are new to the Dharma and may even be of a different faith, those with a longer term relationship with the Dharma, and those who are considering serving as Sikh Ministers. This course also enriches your practice and understanding of Kundalini Yoga and is a perfect complement or follow up to Kundalini Yoga Teacher Training. What all of the participants have in common is a longing to deepen their experience and understanding of Sikh Dharma, and a commitment to take a spiritual journey, along with the other participants, of transformation and inspiration.